Ingredients of PigmentOff – Remover – safe, harmless and EU-approved! On this page we present the composition of Pigment-Off-Remover. Our remover is not acid; it is basic, belongs to the group of oxid-removers, contains only active substances approved throughout European Commission, is manufactured and bottled in Germany. 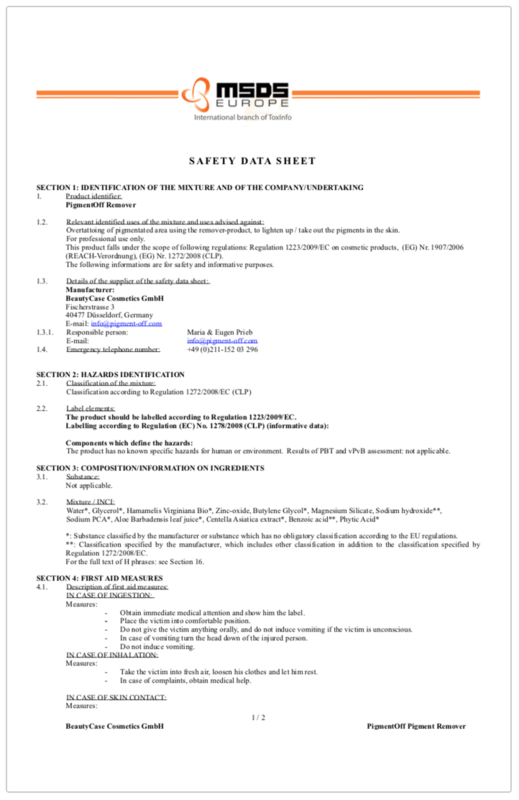 Of course, our product has an international safety data sheet (MSDS). This is available to all our sales partners worldwide and can be submitted upon request. Our product contains no acids. It’s not an acid remover (also no lactic acid), no saline remover, no sea salt remover. It is also not a replica of products already existing on the market, but an independent German development. 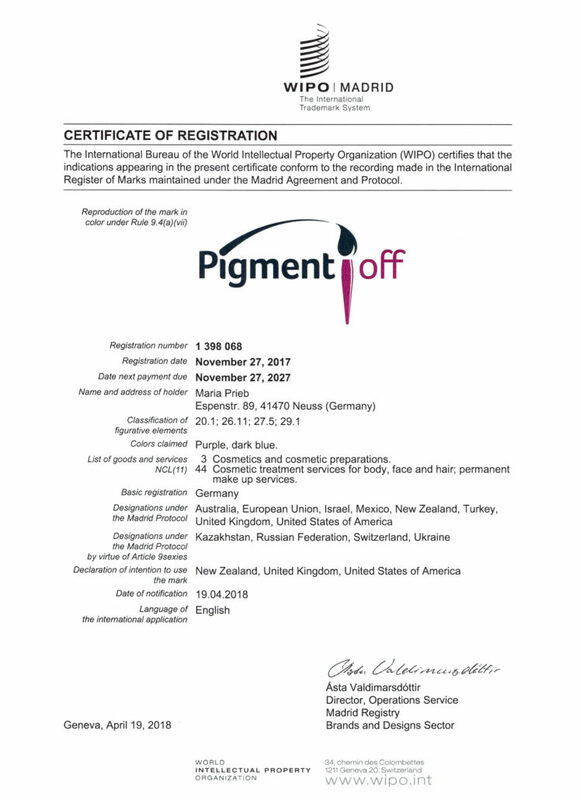 The trademark “PigmentOff” is registered and protected internationally by the WIPO (World Intellectual Property Organisation). Of course, it can be used by our distribution partners, trainers and certified users for the adverzising purposes. Please just ask our company to provide the needed files (your PigmentOff licence number is needed). 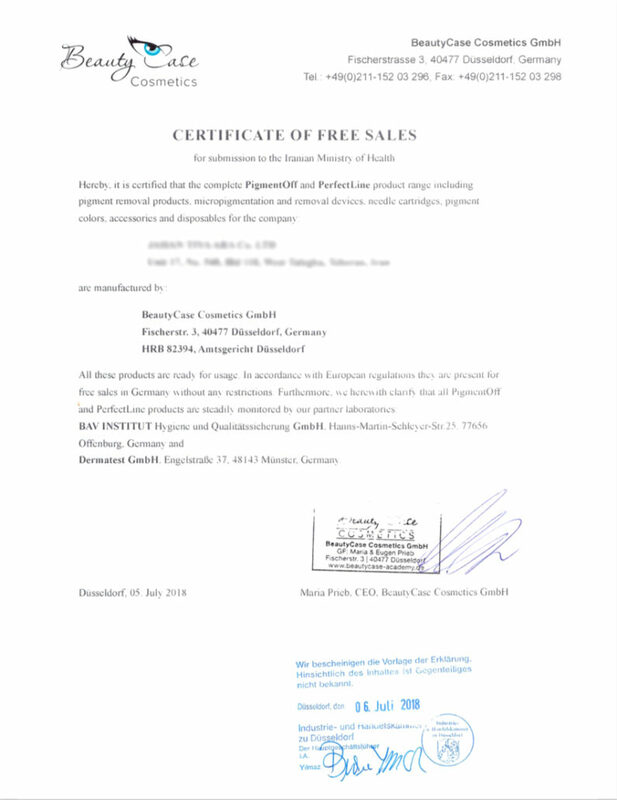 All PigmentOff-products are notified in the European CPNP (Cosmetic Product Notification Portal) and FDA (U.S. Food & Drug Administration) in USA. Of course, we also have testet our care products (SkinSaver Cream, SkinRepair Gel, ScarFree Gel) for skin compatibility. For this purpose, we have selected as a cooperation partner a well-known German laboratory “dermatest“. 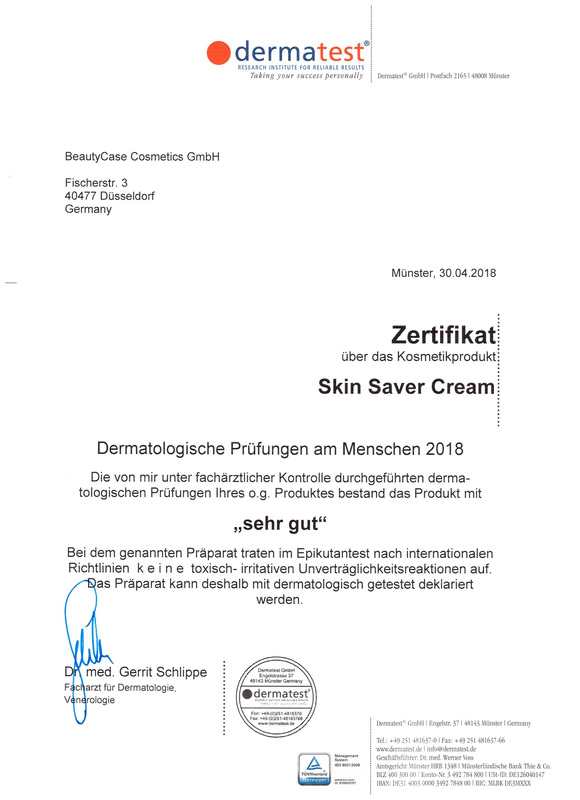 In April 2018 our Skin Saver Cream was tested for compatibility and received the grade “excellent”! Microbiological and chemical laboratory tests are also regulary carried out. The results of these examinations confirm the perfect sterility and worldwide admissibility of the remover PigmentOff. We do everything we can to ensure the safety and quality of our products at the highest level. For export to other countries, we provide our sales partners with the Free Sales Certificate if required. 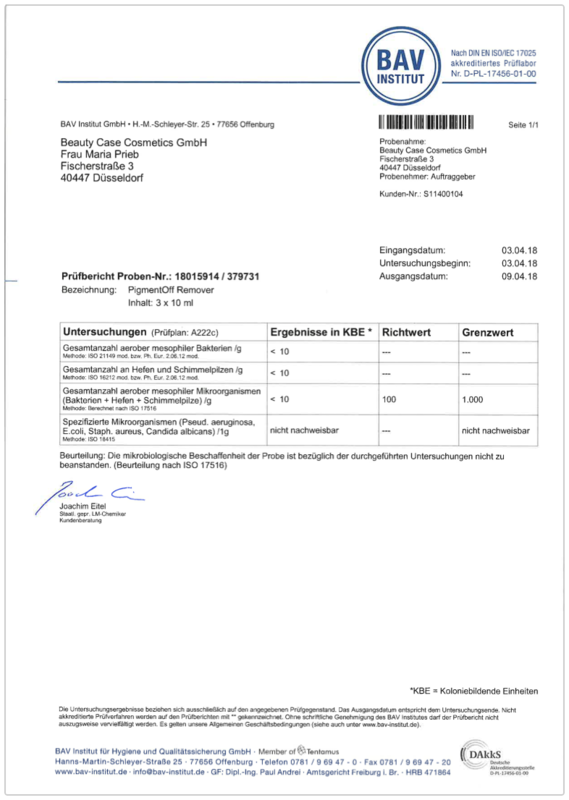 The certificate is approved through the Chamber of Industry and Commerce in Düsseldorf, Germany.